Citizen‘s new Bluetooth controlled Proximity for iPhone 4S and 5 is now for sale and already in stock. 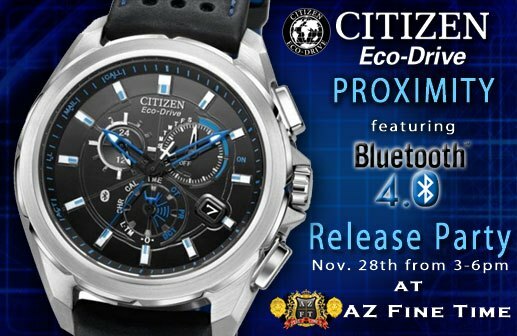 For this release, we will be hosting an event with Citizen USA and will have our local sales rep as well as their top tech guy here in store demonstrating how the new Proximity works with your phone. We’ll have free food, drinks and cigars for this event. Also, we will have special promotions with all Citizen products. 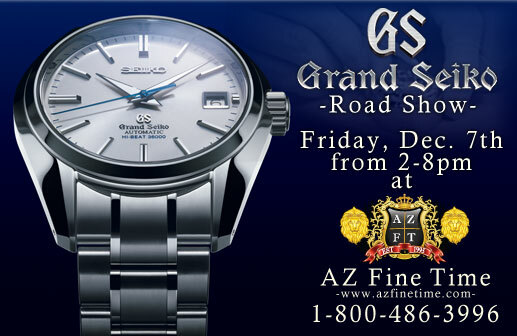 The beloved Grand Seiko Roadshow is back at AZ Fine Time. 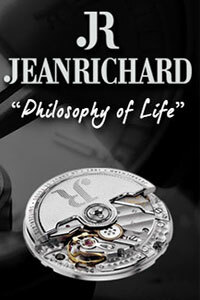 For the 1st time, you will be able to see a master watchmaker build a Grand Seiko Mechanical timepiece here in our store. Every watchmaker we have had in the past has built a Spring Drive movement, so I know there is much anticipation to see a master craftsmen assemble one of the worlds most accurate fully mechanical watches. 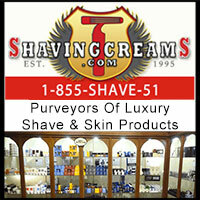 Ashton will be providing complimentary cigars and top notch food will be in store. Also, don’t forget to call us to reserve your Grand Seiko watch for the event and get an autograph from the master watchmaker. Join AZ Fine Time and Alpina brand manager Danilo Stacco for an event to help launch the latest and greatest from Alpina Geneve. As one of the best values on the market for a fine Swiss timepiece, Alpina has a great selection of sporty models for diving, racing and aviation. 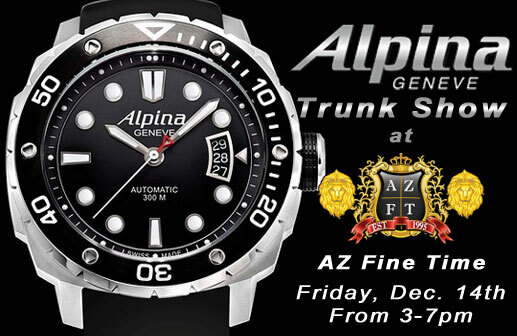 Special promotions will be available with all Alpina purchases. 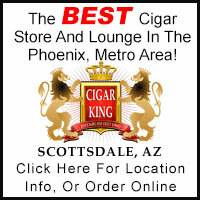 We will also have one of the finest cigars on the market, Davidoff, complimentary for the evening. Of course, food and drink will be in store as well. 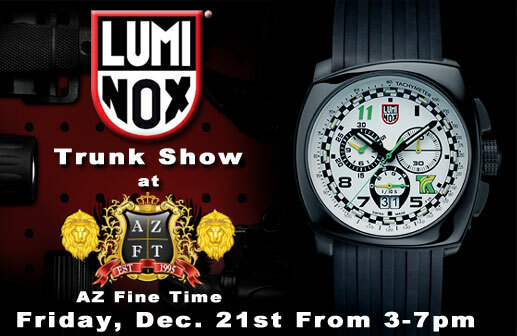 Luminox is one of the newest brands at AZ Fine Time and we are proud to have them in store for our 1st event. 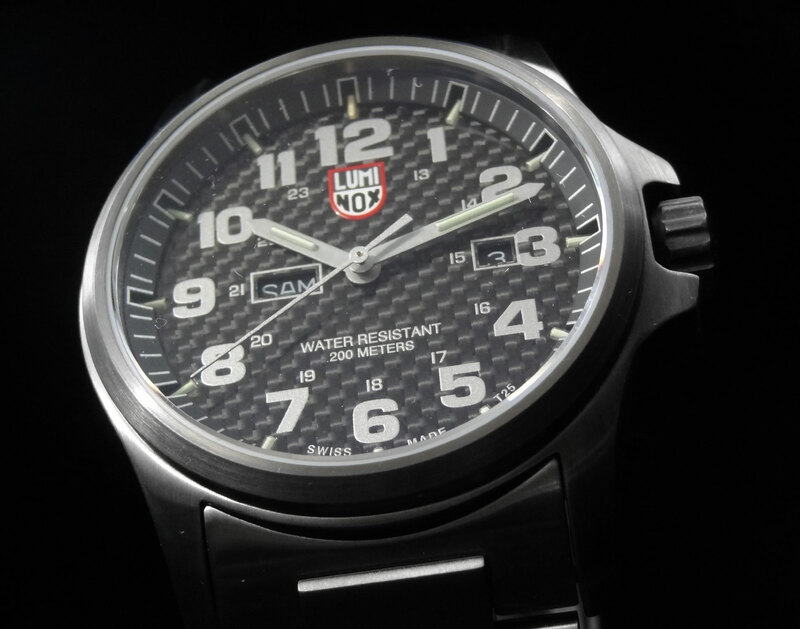 We’ll be helping launch all of the newest models from the ever glowing Luminox brand. Special promotions will be held on Luminox, as well as complimentary food, drinks, and cigars by Jesus Fuego. 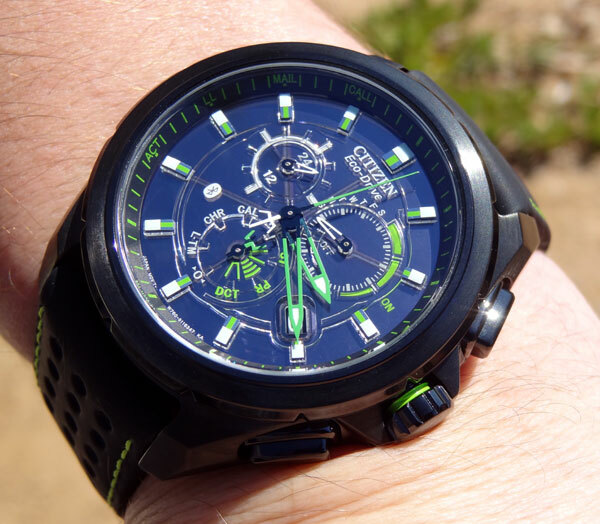 The tie between the watch brand Fortis and space travel has been a tremendous journey. Fortis has had major involvement with the Russian space program for over 17 years and have been their official timepiece for over 15. Their love of space dates back as far as the 1960’s when they 1st released the Spacematic. 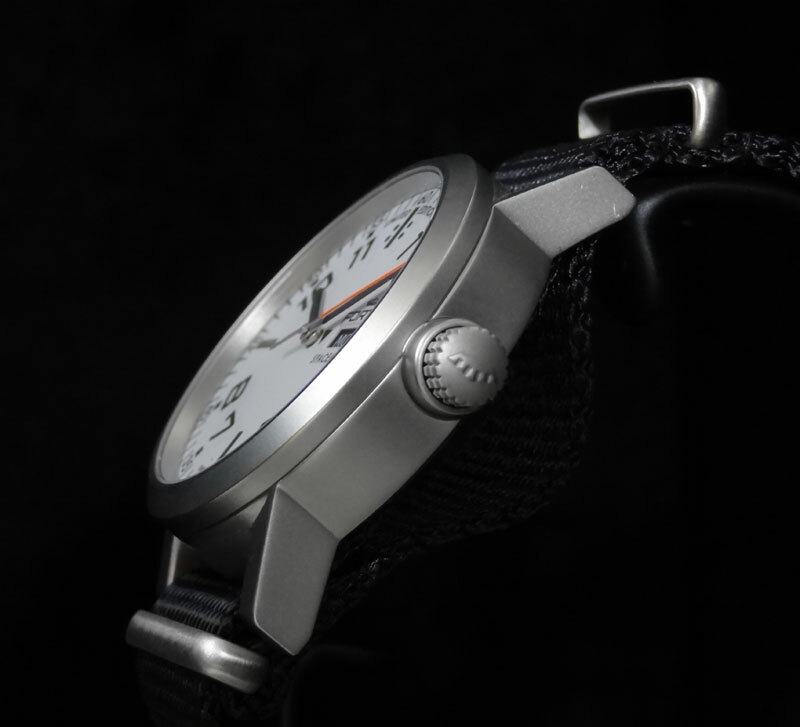 For 2012, and the 100 year anniversary of Fortis, they have introduced a new limited edition that has become one of the most popular pieces here at AZ Fine Time. 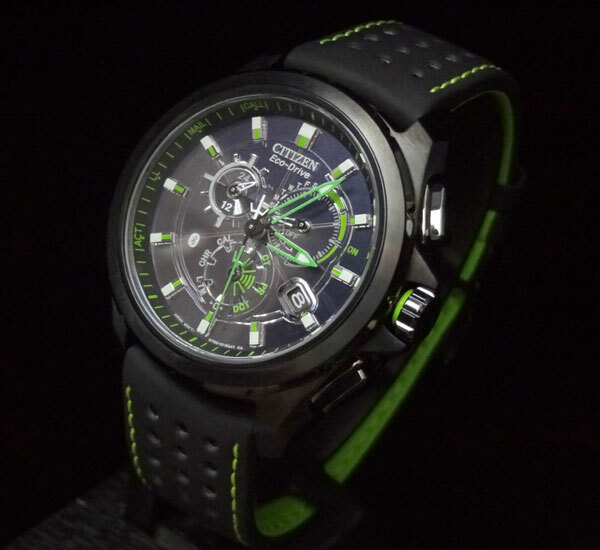 The Fortis Spacematic Limited Edition 2012 623.22.42. 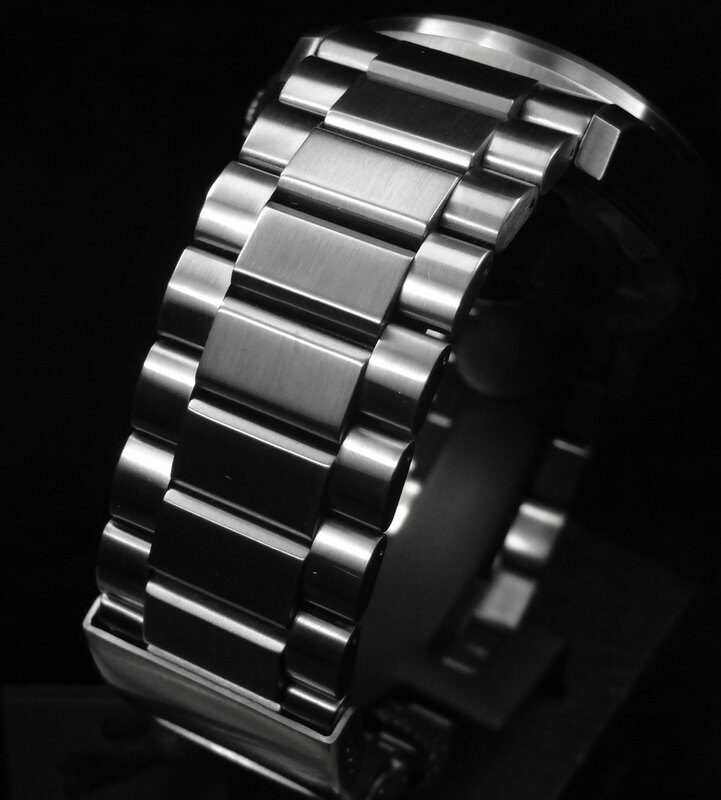 The 40mm 2 part stainless steel case is completely micro-sandblasted to give the steel a complete matte finish. 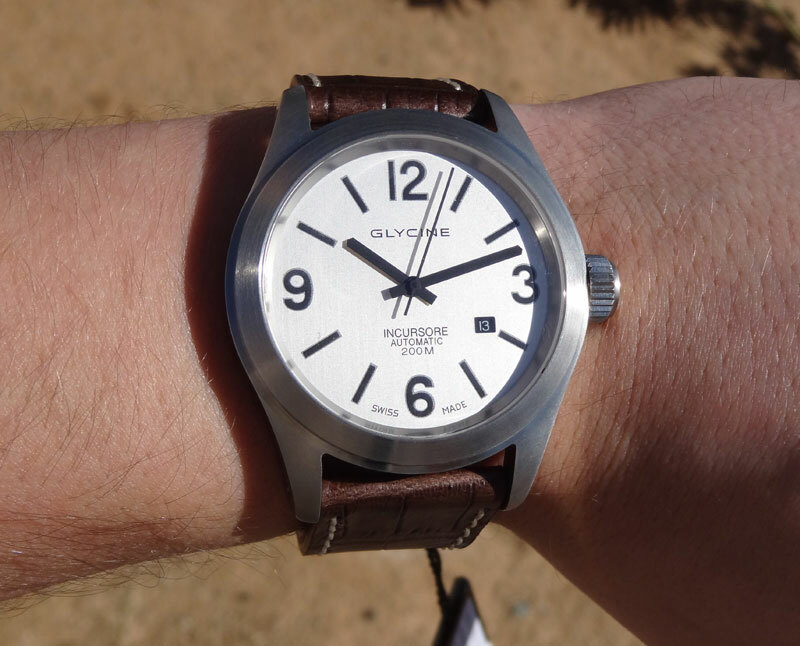 The finish is great to hide signs of wear and also complements the watches look completely. The crown is a very uncommon design that when unscrewed, protrudes out pretty far, but when screwed in, recesses in to the case and wears quite comfortably. What is really nice is that the crown is very easy to handle, which of course was designed with that intention. The dial on this piece is a very unique. 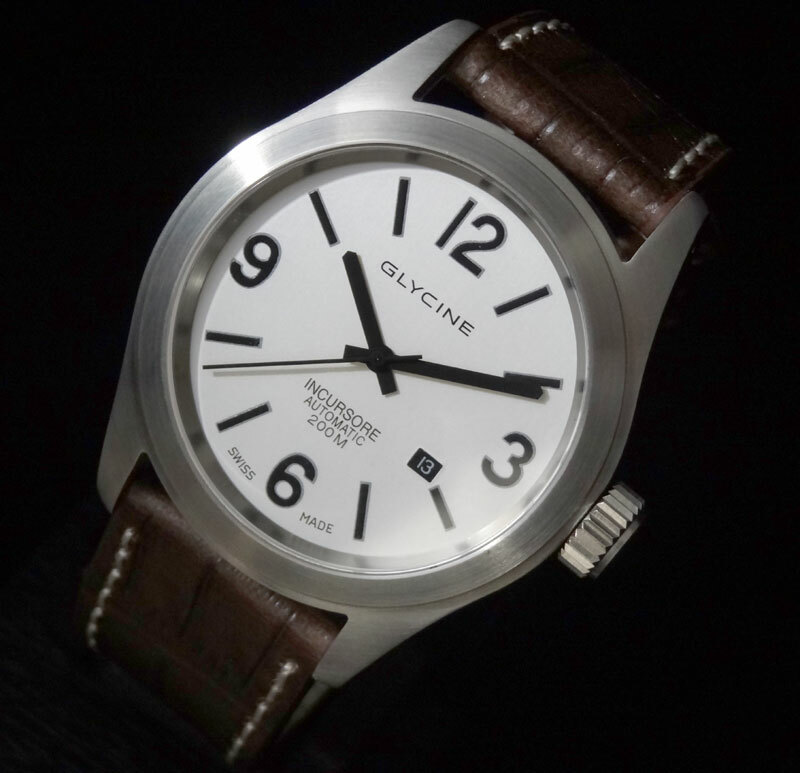 The Arabic numerals are very sharp and crisp on the white dial and the indexes at 6, 9, and 12 o’clock add extra detail. The dots above the each hour marker as well as next to the twelve o’clock index, also add to its uniqueness. The day/date at 3 o’clock is also aligned to look just like the indexes to help give the piece symmetry. The orange second hand is also an eye catcher, but most aspects of this watch make it hard not to notice. 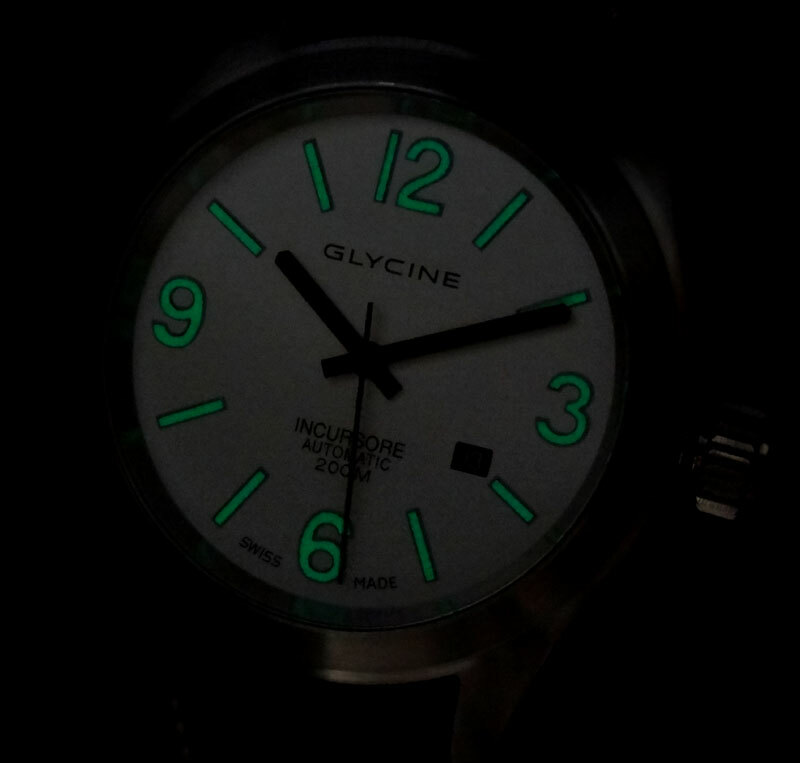 The lume is what really makes this dial stand out. 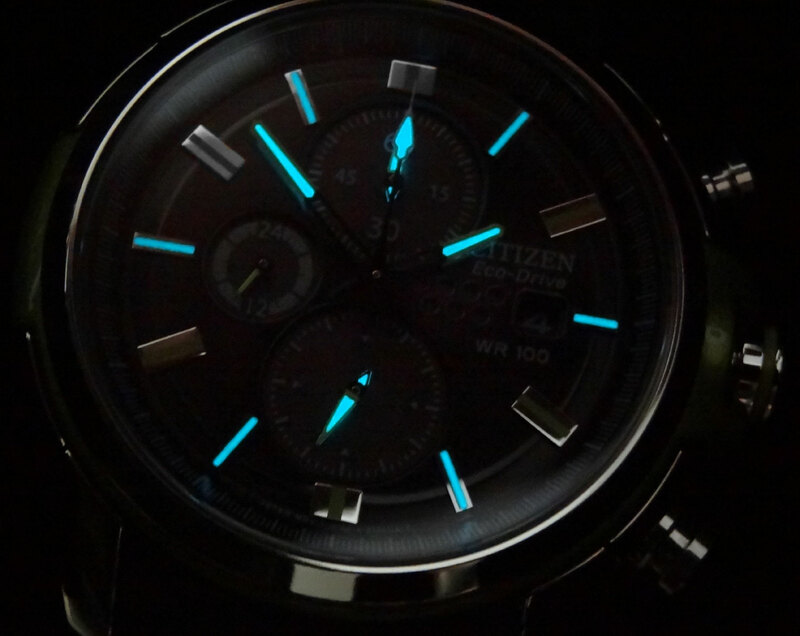 All the white found on the dial is actually a blue super luminova that glows incredibly bright. This makes for an easy read, even in the darkest of conditions. 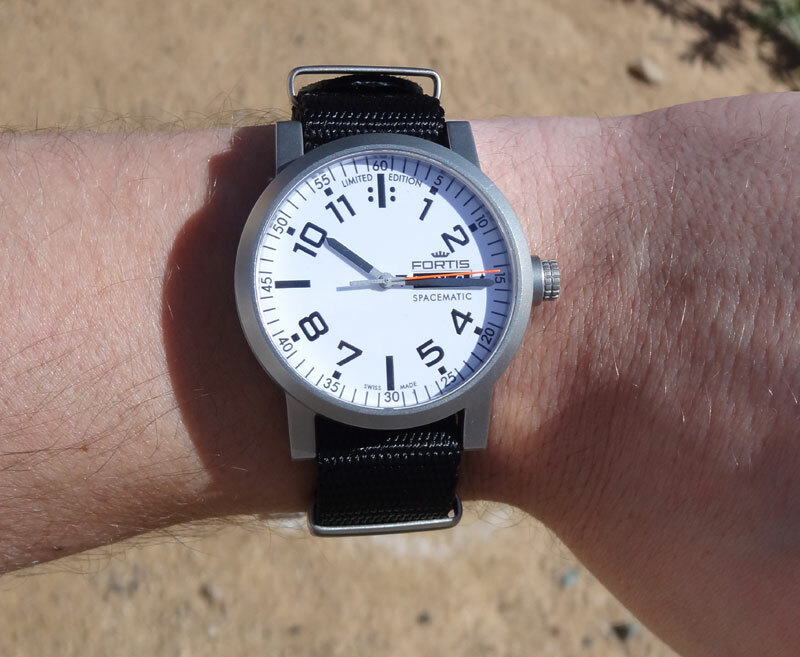 There are many variations of straps available for the Spacematic, but our favorite is the NATO. There are 3 colors available, black, tan and a dark green, all of which look fantastic. 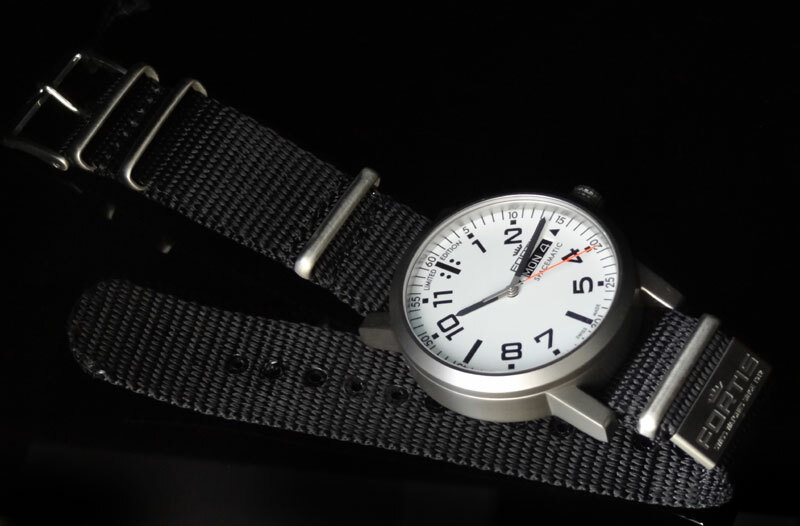 The NATO straps are not only durable and take long times to wear down, but are also quite comfortable and very secure. 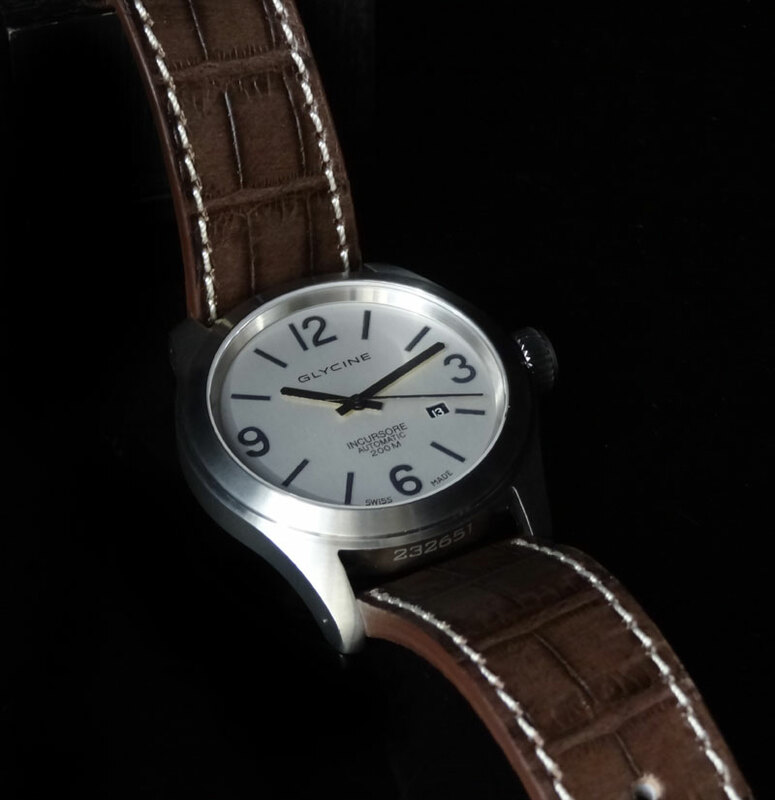 The automatic movement is an ETA 2836-2 with day/date feature. It has a rate of 28,800 bph, 25 jewels and an incabloc shock absorber. The case back is closed, so you do not get to see the movement, but if you were wearing it on the NATO strap, you wouldn’t see it anyway. Even so, the watch is sealed tight, just in case you want to take it with on your next space expedition. 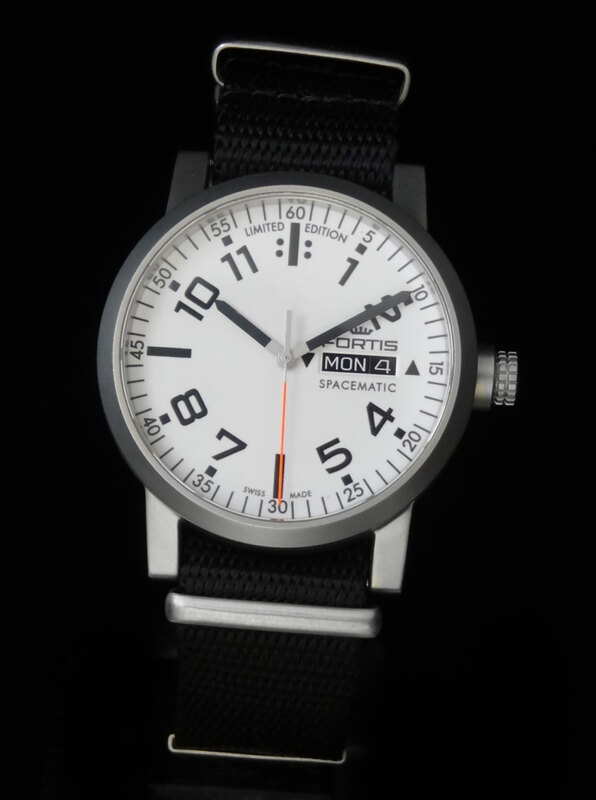 The Fortis Spacematic Limited Edition 623.22.42 retails for $1,225 and is one of the most affordable Fortis pieces on the market. It’s a tremendous value on a great timepiece. This piece has been loved by many and even the original Mercury Astronauts were known to have the Spacematic on their wrist. Fortis has just recently launched a contest where your space inspired artwork can win a free parabolic flight on a Zero-G spacecraft. Please see HERE for more details. Should you have any questions regarding the Spacematic, or any Fortis timepiece, please feel free to call us at 1-800-486-3996. 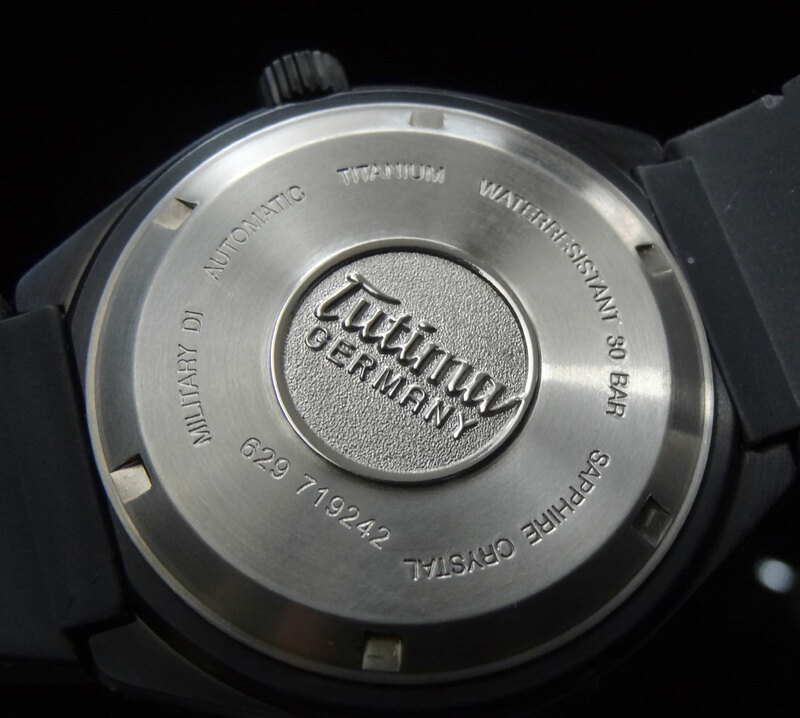 Founded in Glashütte in 1927 by Dr. Ernst Kurtz, Tutima is a brand strong in tradition and quality. 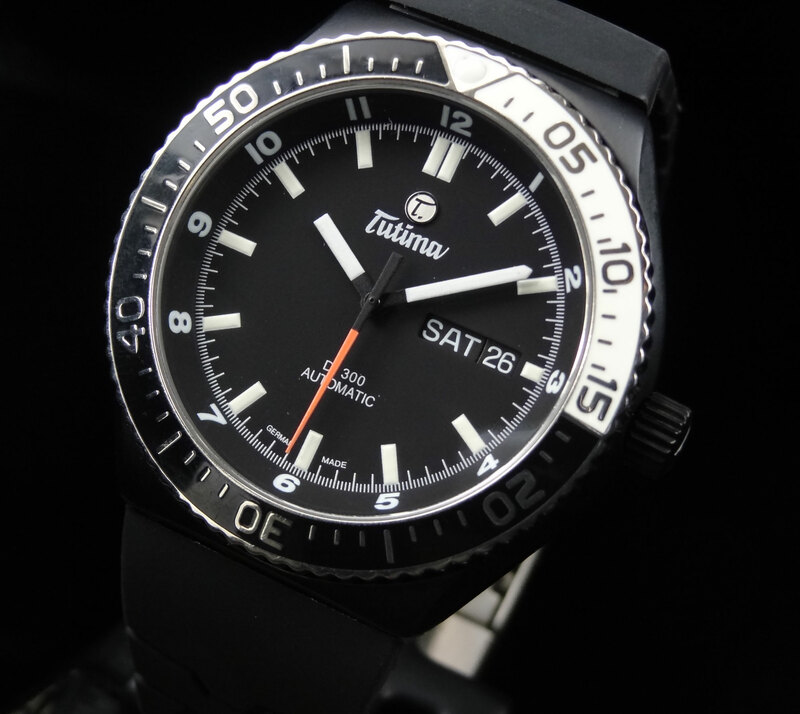 Deriving from the latin term “tutus”, which means safe or protected, Tutima lives up to the name in making durable and precise timepieces. Today, we are featuring one of their most popular series, the DI300. To be more specific, the Tutima DI 300 Black 629-51. 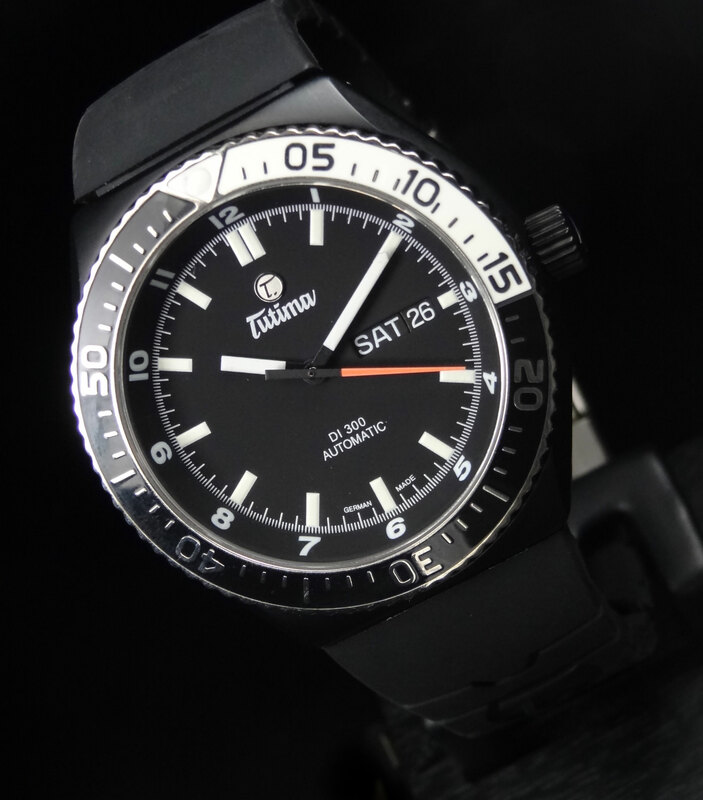 In 2005, Tutima partnered and became the official timekeeper at the Kieler Woche Regattas, which helped launch the Tutima DI 300. 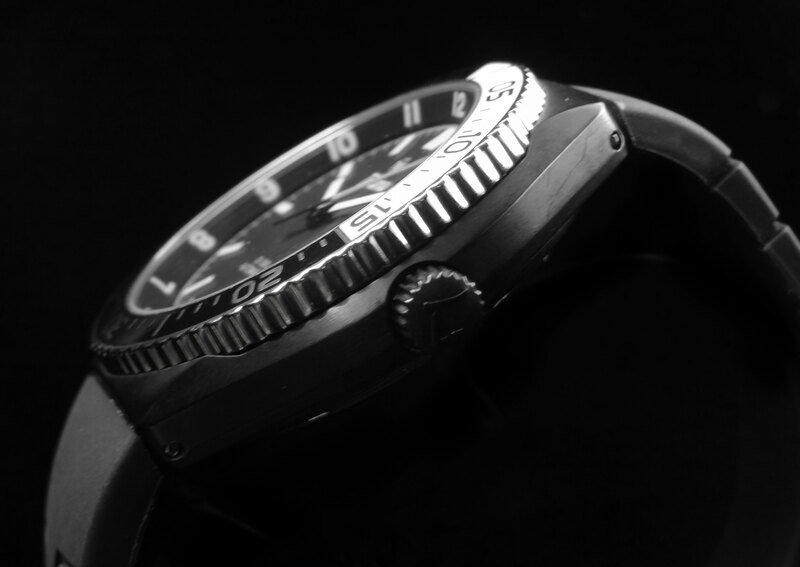 Made to withstand all the rigors of the water sport, the DI 300 was a tremendous success and proved to be a high quality (and durable) timepiece. Throughout the years we have seen different variations of this model, but one of the newest releases, is the PVD coated 629-51. 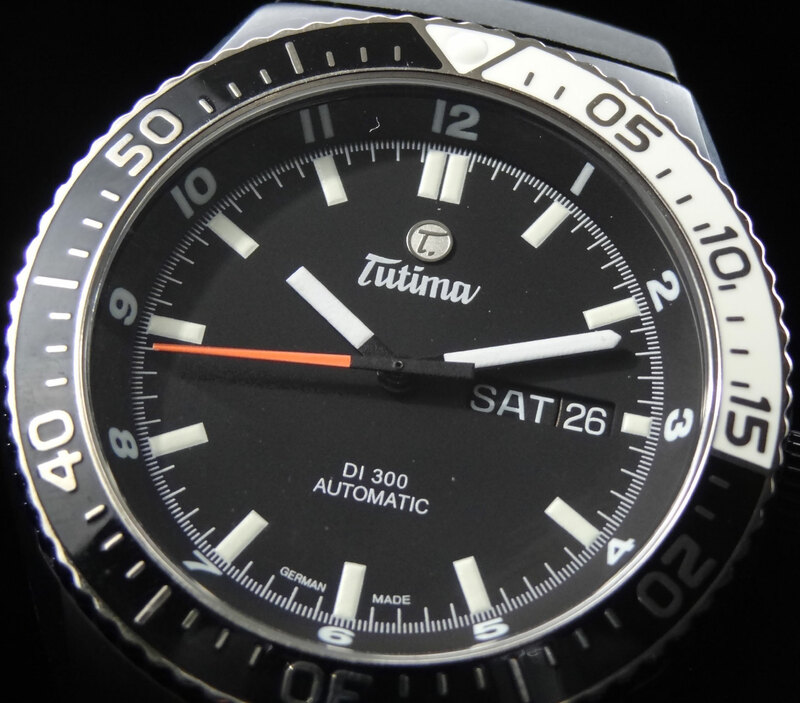 The Tutima DI 300 Black 629-51 is a PVD coated pure titanium case the is 43.5mm wide and and sits 12.5mm high. The case design is very nicely done, with a nice rounded feel to it, but still a unique enough shape to make it stand out. The bezel is what really makes this piece “pop”. It’s 60 min unidirectional bezel is mostly black with white numerals, but the 60 to 15 is a pure white, which to me gives the piece a different feel than other all black watches. The dial is simple and very legible. The luminescent stick indexes and hands contribute to it’s legibility on the contrasting black dial. The chapter ring also has arabic numerals that sit right above the index, while you may think this would clutter up the dial, using them on the chapter ring keeps it clean and prevents the cluttered look. Another great addition to the character of this piece, is it’s bright orange second hand. 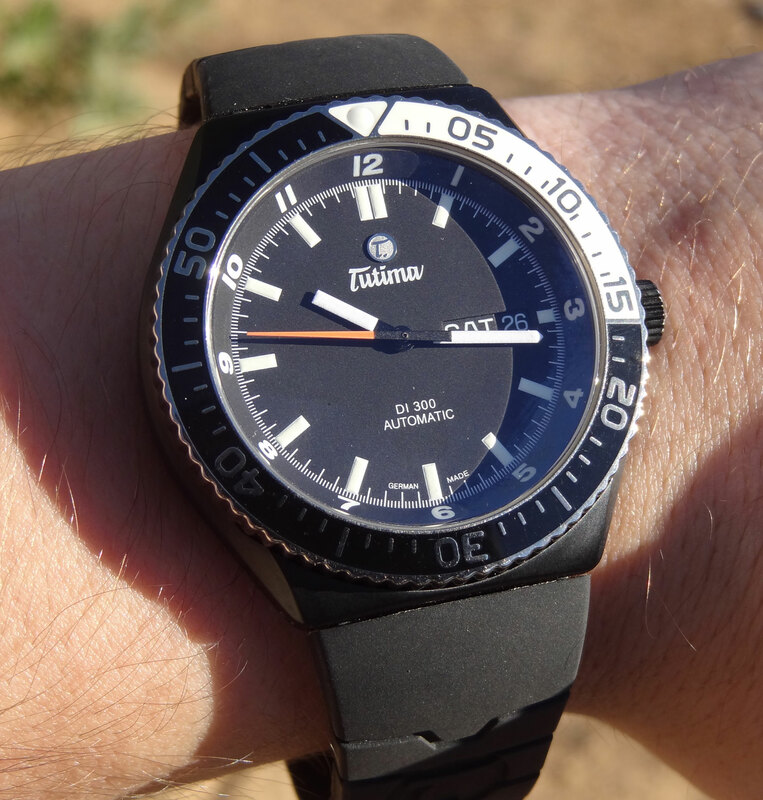 The Tutima DI 300 Black 629-51 is water resistant to 300m and has a screw down crown. It also has sapphire crystal with anti-reflective coating on the inside. 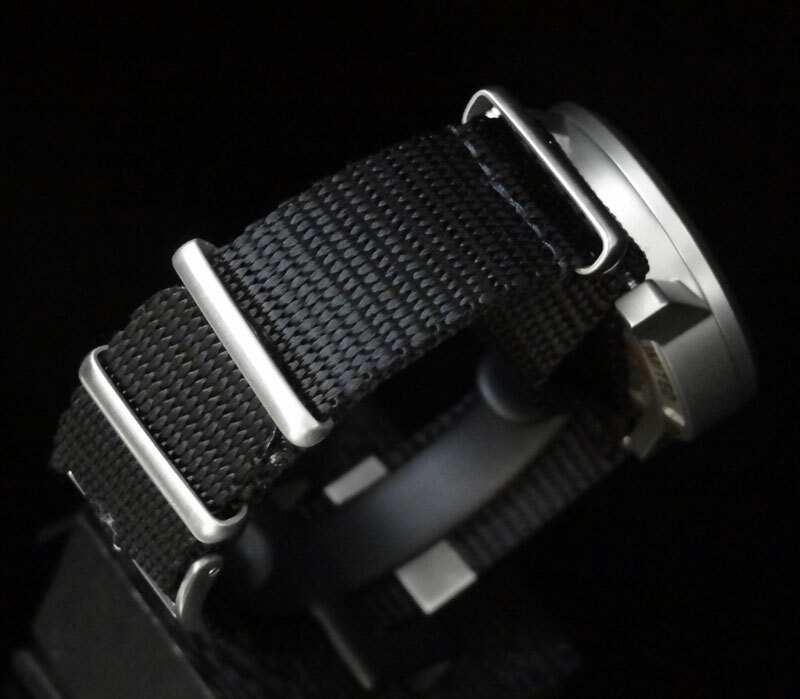 The cut to size rubber strap is also very nice and has a titanium deployment clasp with a security buckle and integrated divers extension. The movement is an ETA 2836-2 with day/date feature, which Tutima assembles and decorates in Germany. The retail on the DI 300 Black is $1,850, which is very reasonable for the quality. As always, if you have any questions regarding this or any Tutima, please feel free to call us at 1-800-486-3996. 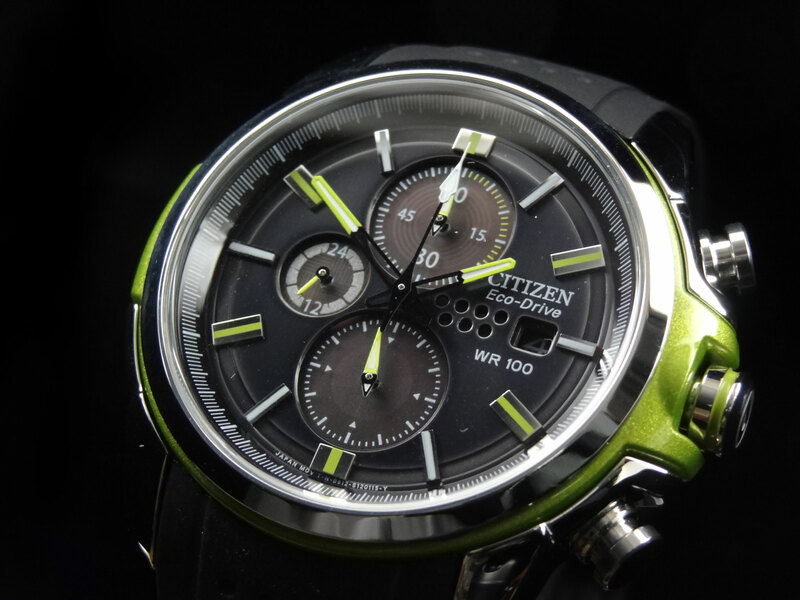 A new series introduced late this year and has already started to hit shelves is the Drive, by Citizen. 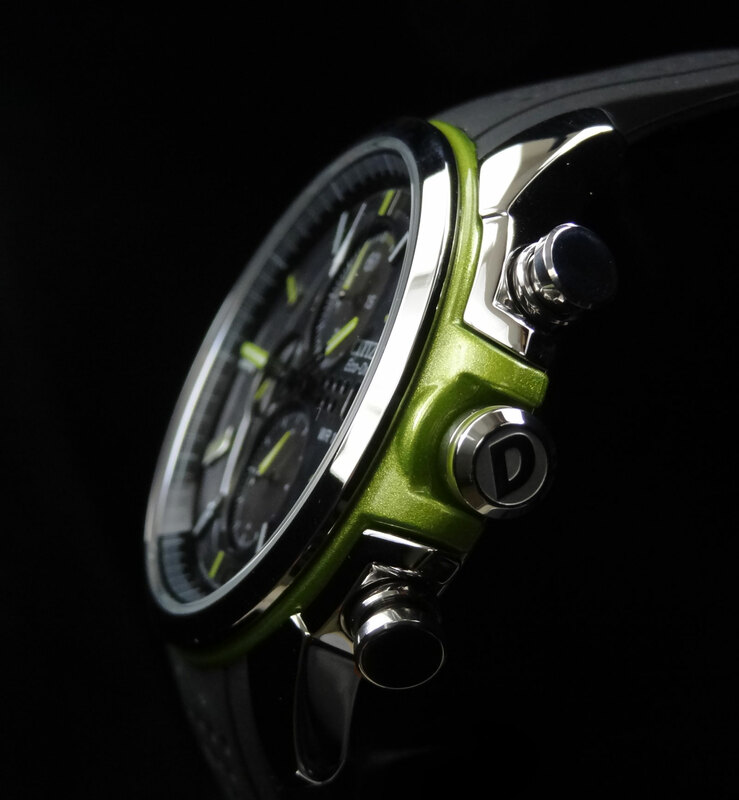 Drive is a uniquely designed series, that is targeted towards the next generation of watch buyers. With some fresh new designs, cool new colors of finishing and phenomenal price points, Drive will easily have a great new following at any age range. 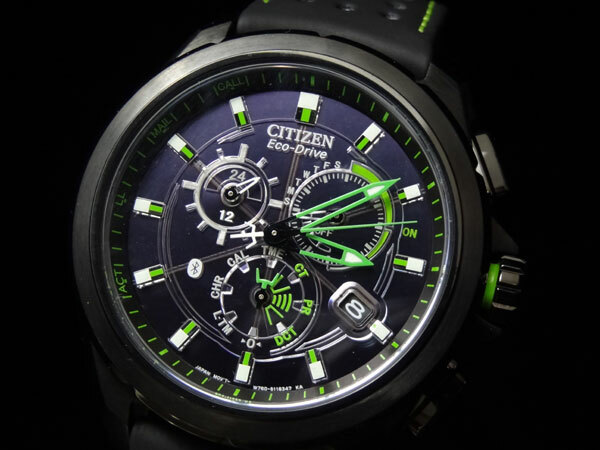 Today, we are featuring the Drive by Citizen Eco-Drive AR2.0 Collection Chronograph CA0427-08E. 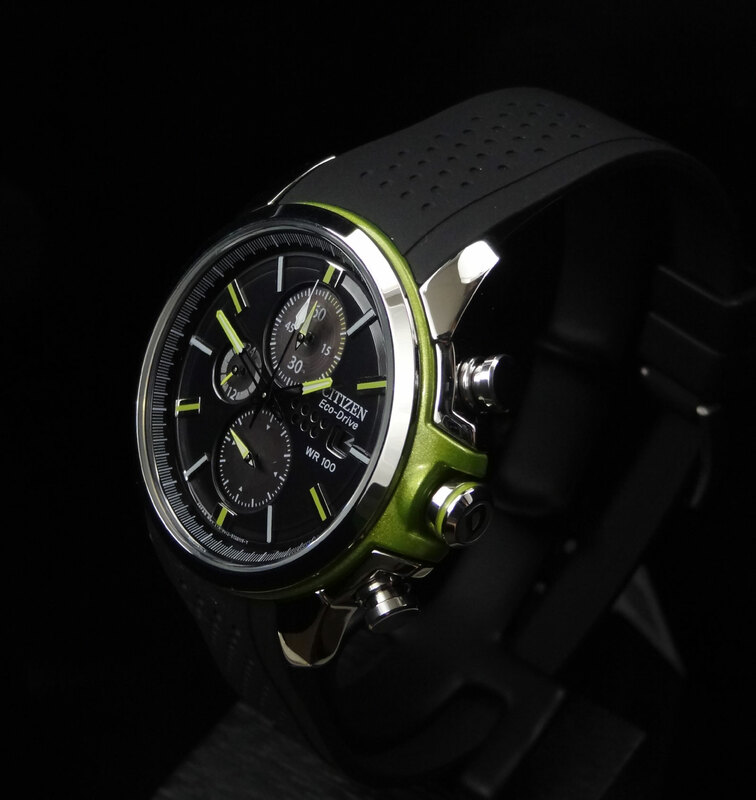 The Drive CA0427-08E is a 44.5mm stainless steel case with a black dial, electric green accents and black rubber strap. The design is fairly large in width, but not very thick. In fact, it is only 11mm thick, which was surprising when seeing them in person. 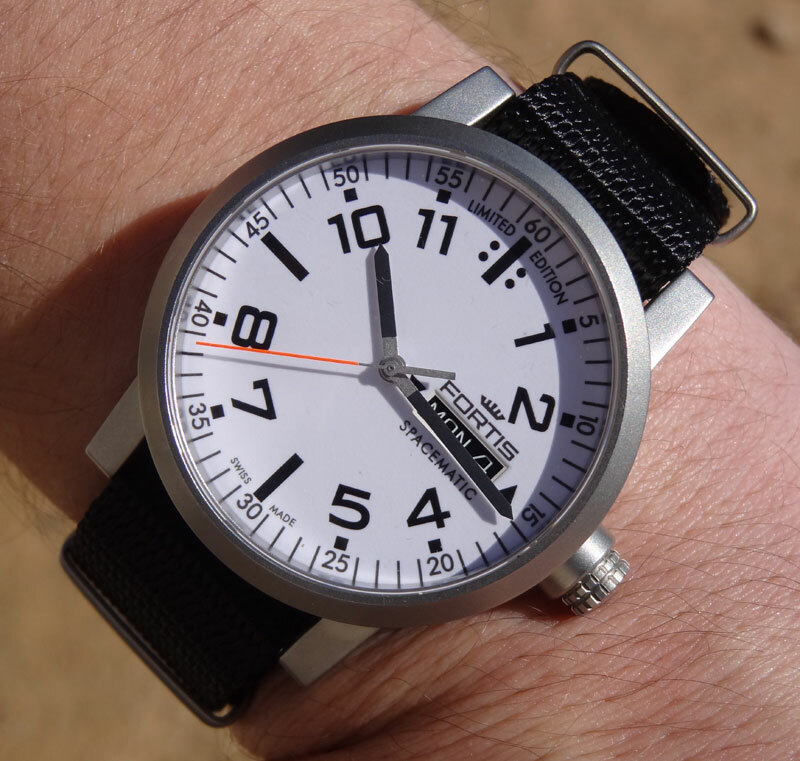 The lug to lug height (from 6 o’clock to 12 o’clock) is only about 47mm, making it a nice size and not over hanging your wrist. 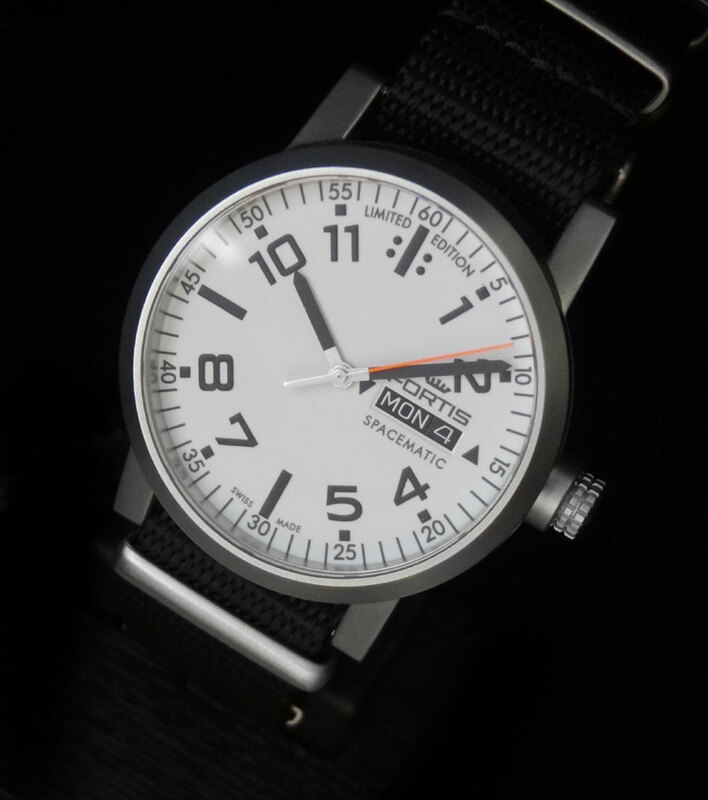 The dial layout is very clean and easy to read. 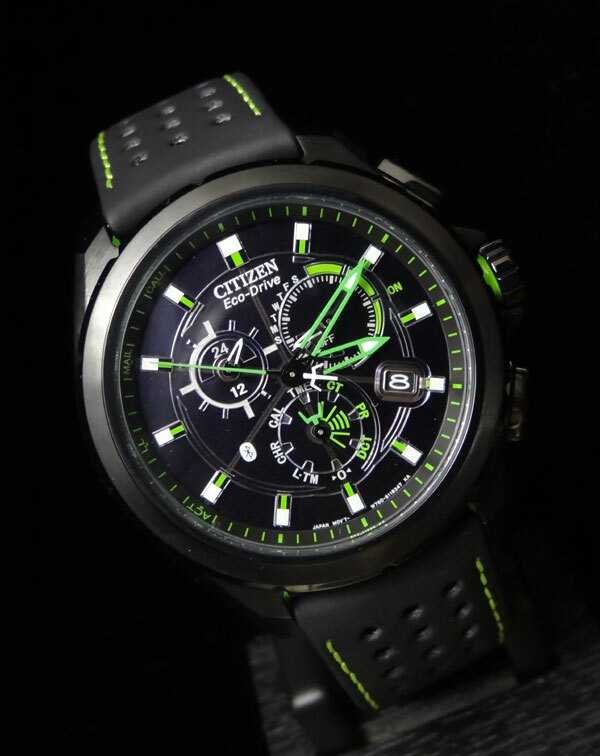 The even number indexes and hands are in electric green giving the watch a fun and unique accent color. 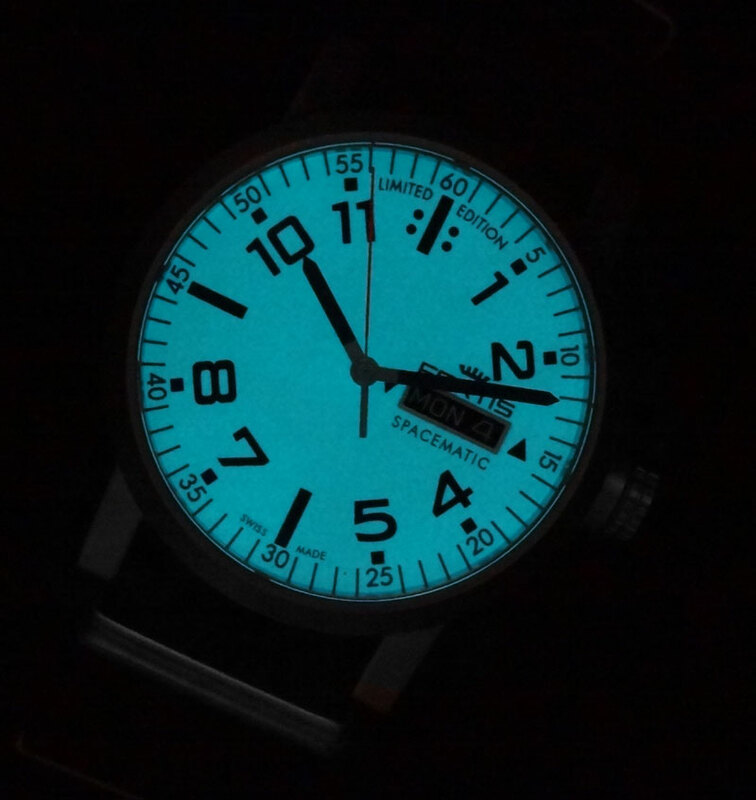 With the odd number indexes, they have applied Citizen’s usual blue lume (which looks white when not illuminated) making it very legible at night. 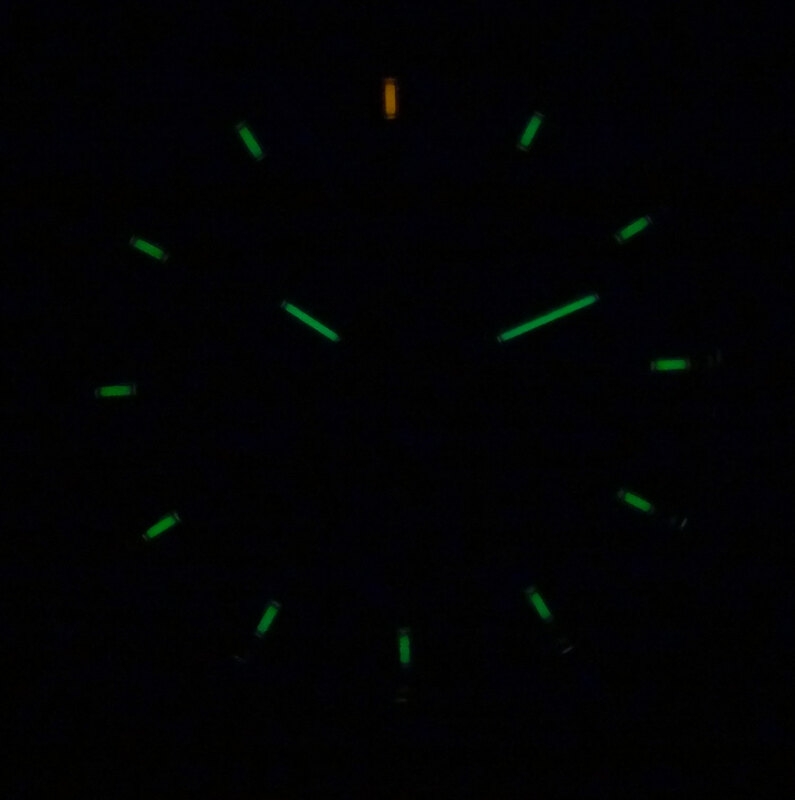 The lume is not only on some of the indexes, but on all the hands excluding the 24hr dial at 9 o’clock. 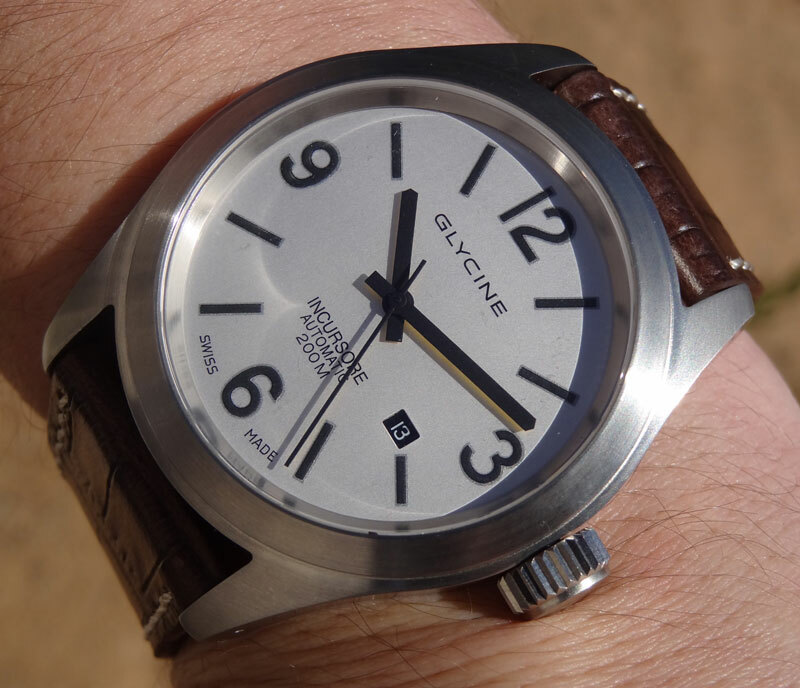 It’s easy to spot the solar panel aspect of the dial, which is exposed through the sub dials at 12, 6, and 9 o’clock. 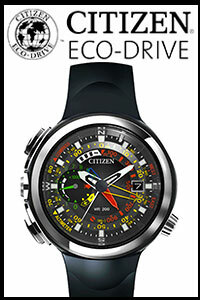 The movement Citizen utilized for this piece is their Eco-Drive B612. 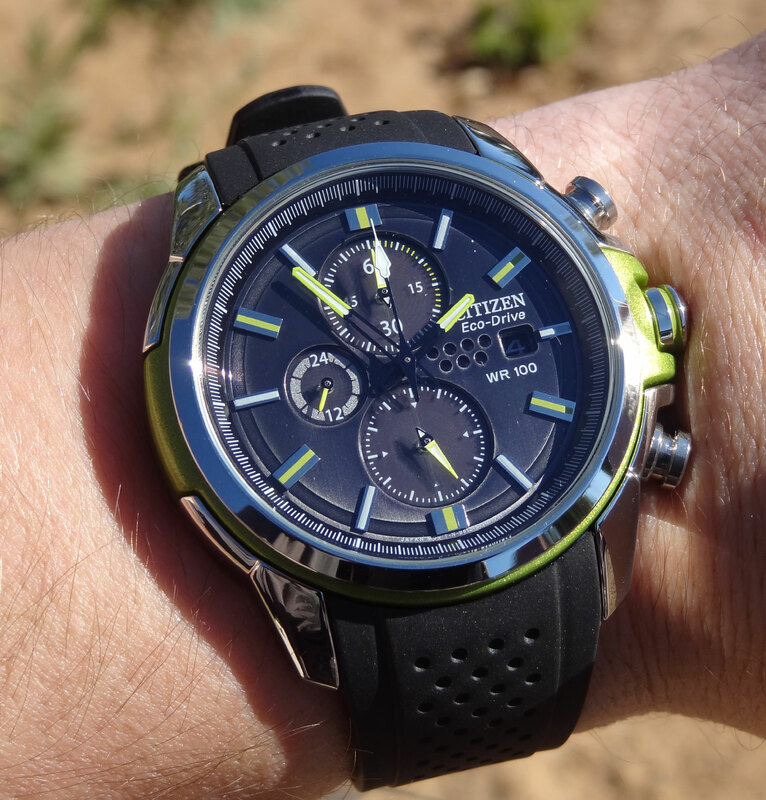 The B612 can be found in some other variations of the Citizen Eco-Drive series, and features a 1/5 of a second chronograph, which only measures up to 60 minutes, but also displays a 24 hour time. 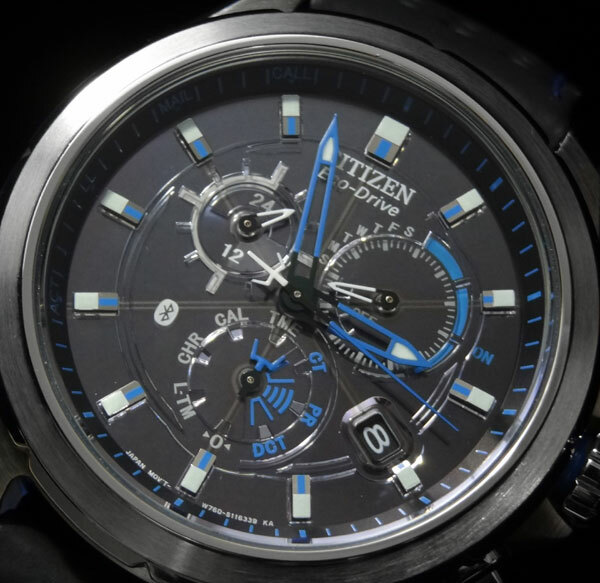 This movement has a 7 month power reserve at a full charge, which is pretty impressive, especially considering the price point. 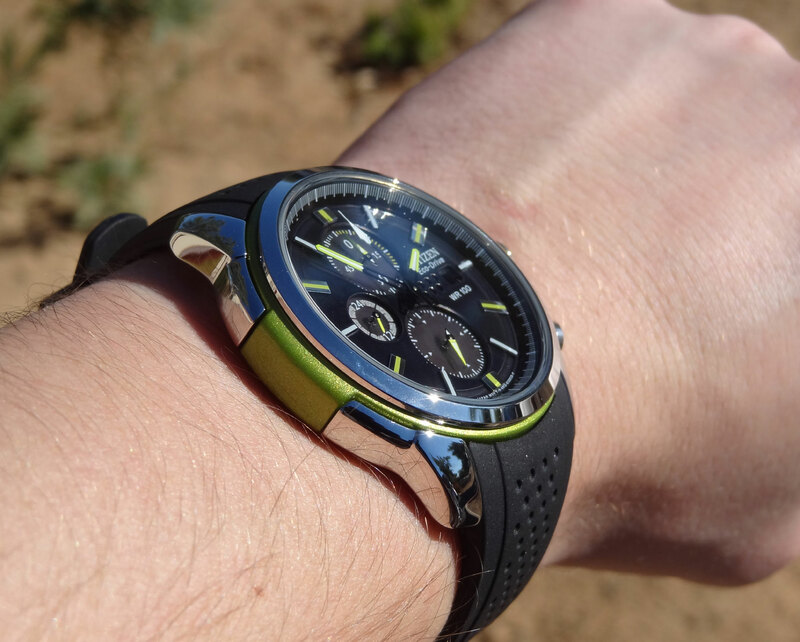 One of the most interesting factors of this watch is its green finish on the case. 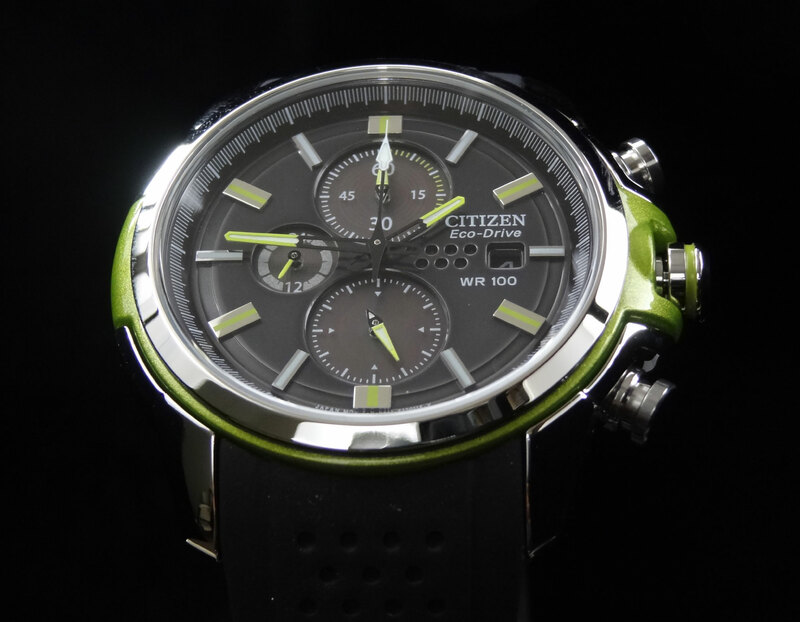 Citizen has a new proprietary technology called Chroma finishing. This new method of plating allows for Citizen to give the piece a similar color to Peridot metallic green (from the Porsche Cayman R), but is highly durable and scratch resistant. 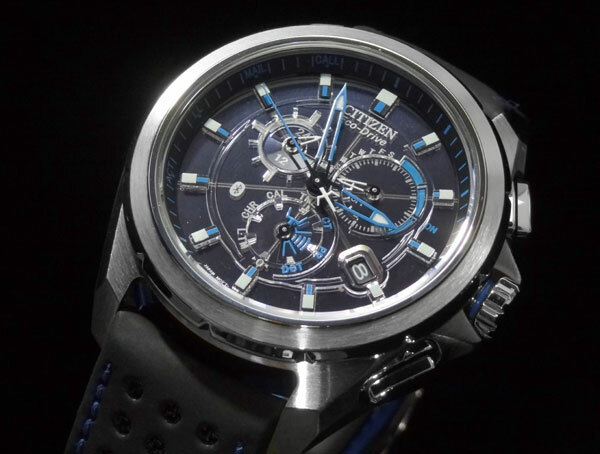 Overall, the Drive by Citizen Eco-Drive AR2.0 Collection Chronograph CA0427-08E is a very nicely done piece. Even better, retail is only $275, which is below what we expected to see them at. 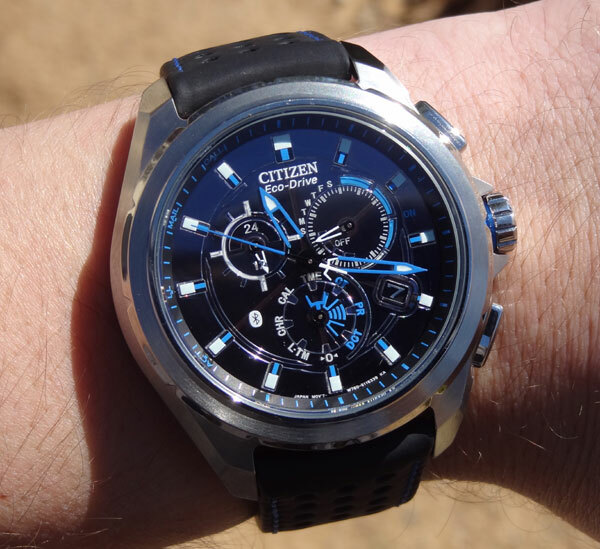 As we found out, all pieces in the Drive by Citizen series are below $295 retail. I hope you enjoyed the new introduction and with any questions, please feel free to call us at 1-800-486-3996 with any questions. Built for the rugged conditions of the Atacama desert in Chile, the Luminox Atacama Land series has a rugged look and durability that can withstand it all. 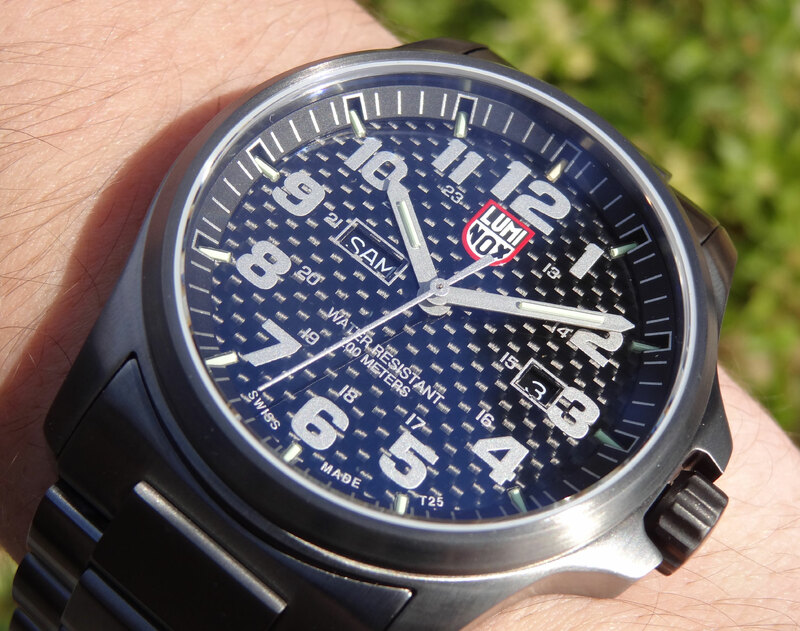 The latest introduction to this series is the Luminox Atacama Field Day Date A.1922. 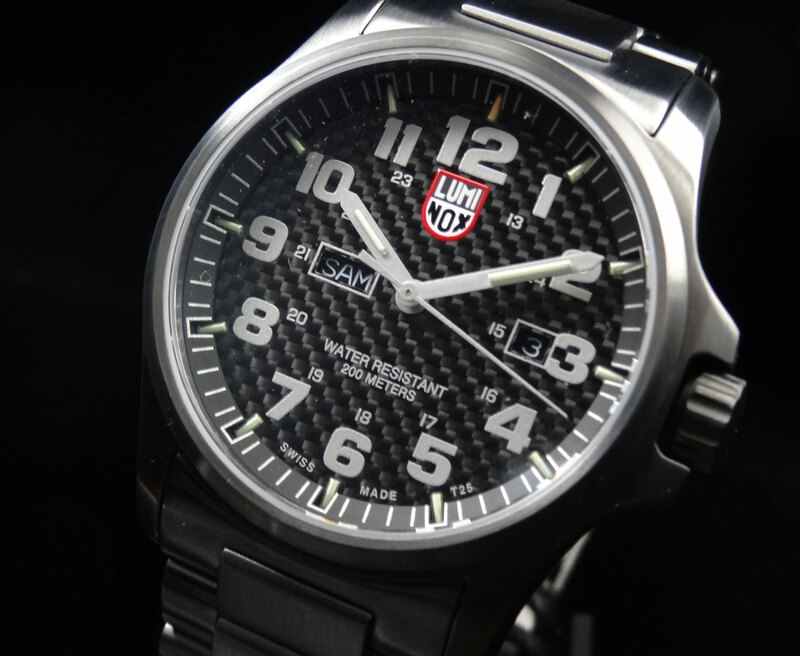 This Luminox is bigger than most you will see. 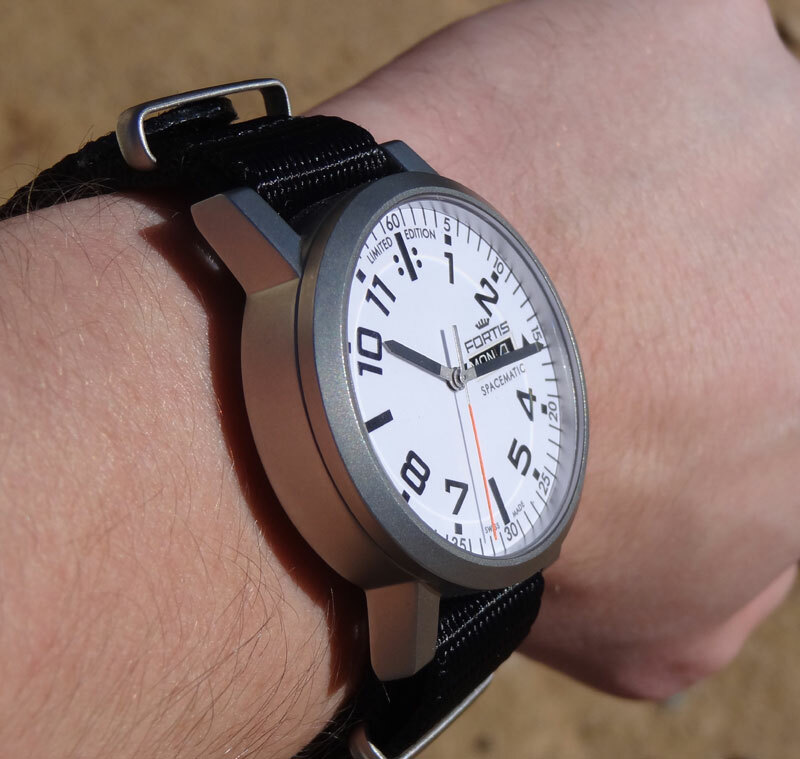 At 45mm wide and 13mm thick, the A.1922 is a beast of a watch and hefty at 205g. 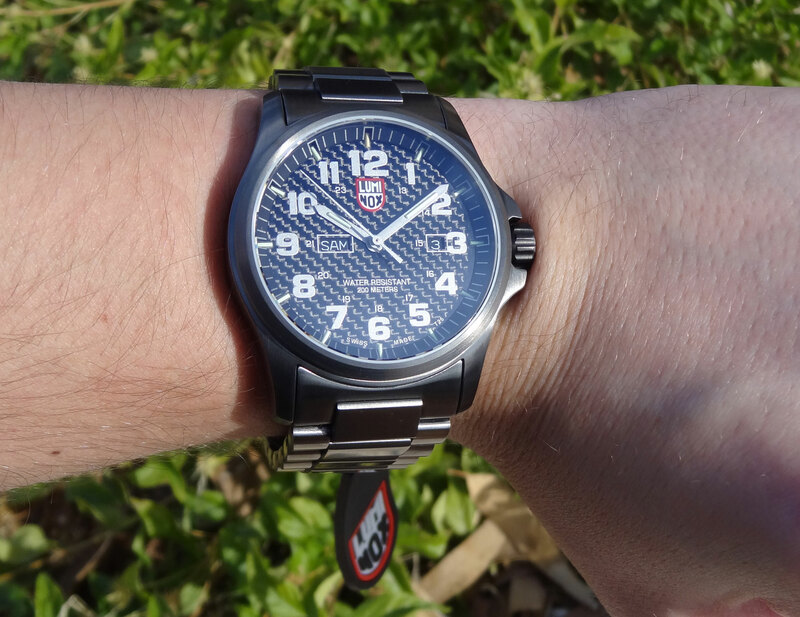 The larger built, heavy steel case and bracelet give the watch a very nice feel, but what makes it especially different, is the gun metal colored PVD coating. This creates a look unlike most other watches, which usually use a matte black PVD, and gives it a semi-steathly, dark appeal. 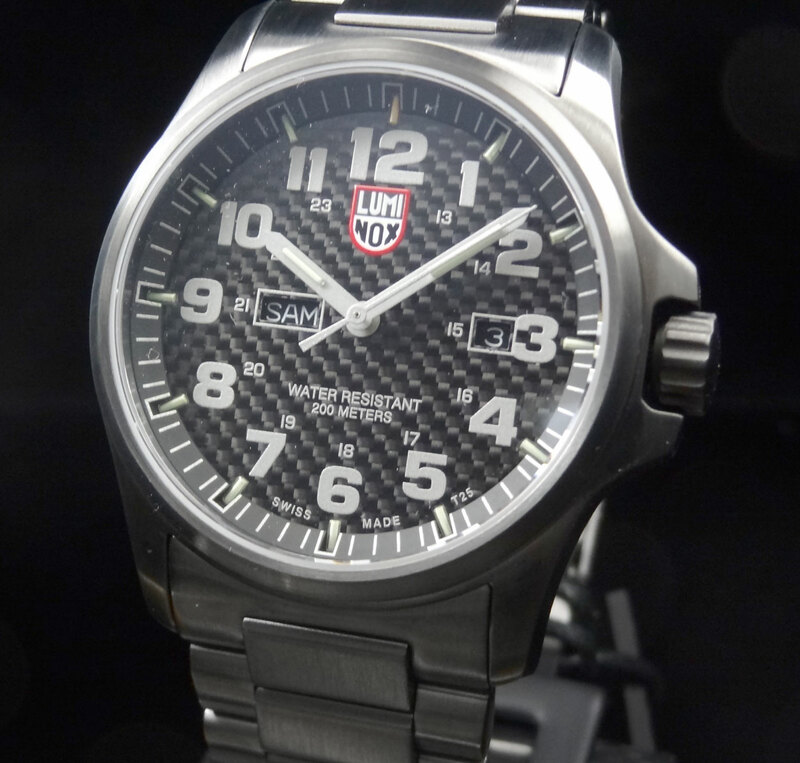 The carbon fiber dial is deeply recessed with it’s tall chapter ring coming in at a slight angel. This watch has a ton of depth to it because of that. Not only do the actual depth and angled chapter ring contribute, but the carbon fiber always tends to give the optical illusion that the numerals are floating somewhere in between. The silver hands and numerals pay great compliment to the gunmetal color of the case, but are also very large and highly legible. On this deep dial, you will find the date at the 3 o’clock, and the day at the 9 o’clock. Build and design are what makes the watch look great, but there are plenty of other characteristics that enrich this piece. 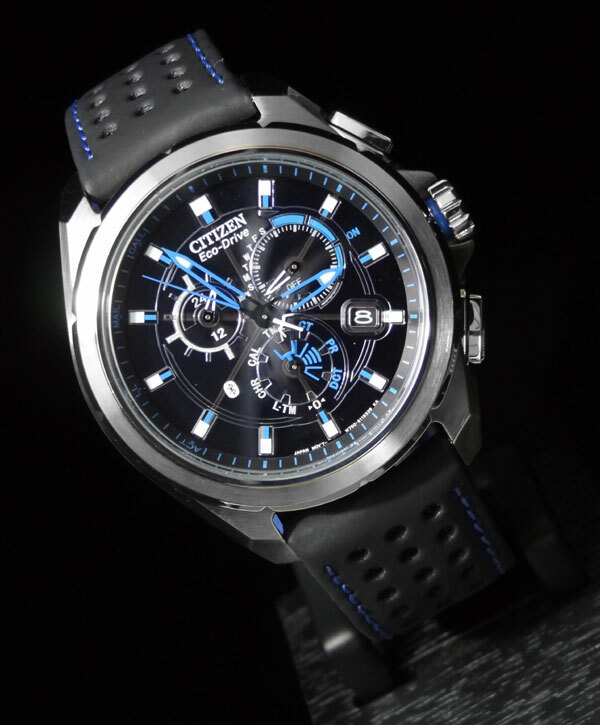 The watch has a sapphire crystal with anti-reflective coating, screw down crown with 200 meter water resistance and Luminox’s famous tritium gas tubes that with illuminate for 25 years in any light condition. 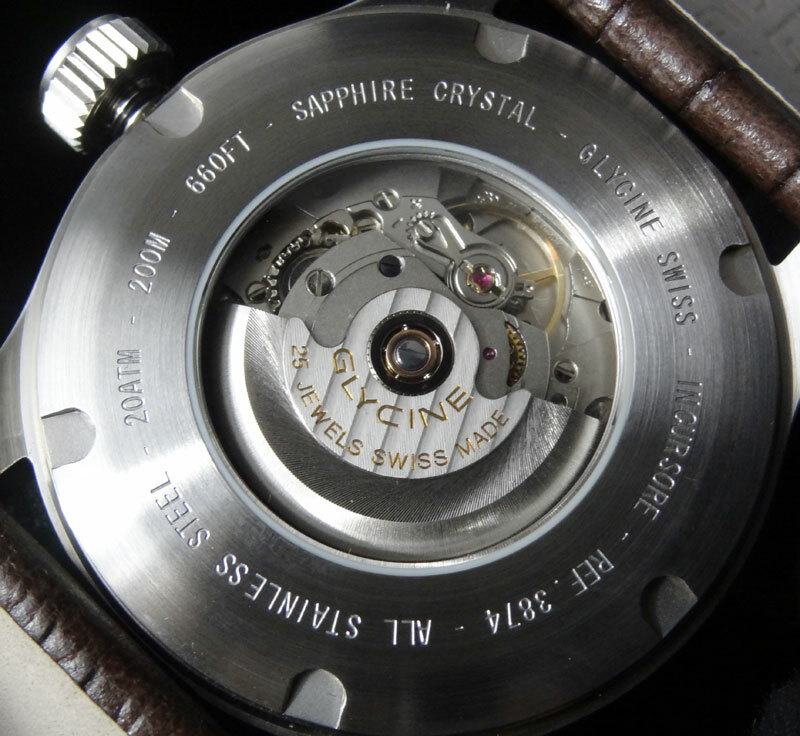 The movement is a Quartz Ronda 517. 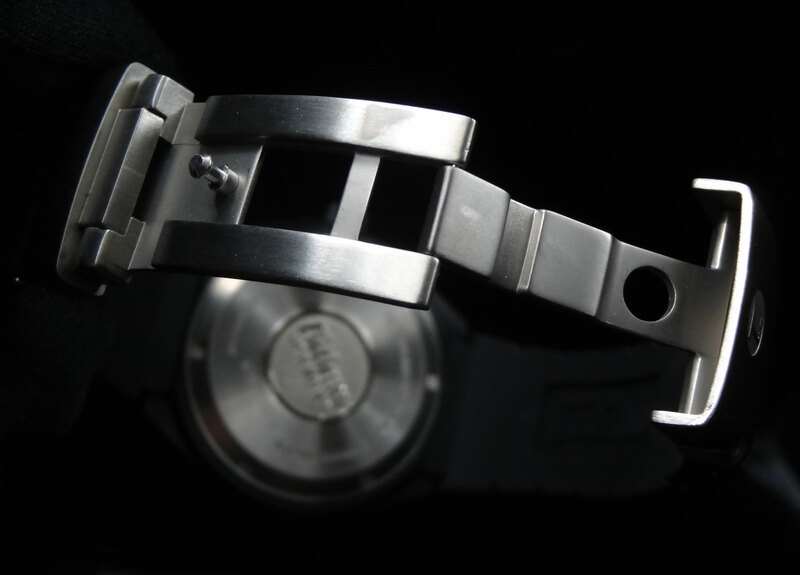 This is a Swiss, metal, one jeweled movement, with a powerful stepping motor. The features are for simple three hand time keeping, day and date, with a slight modification putting the day at the 9 o’clock. The battery life on this is about 45 months. Retail on the Luminox Atacama Field Day Date A.1922 is $750, but can be purchased directly through our website for $675 HERE. As always, if you have any questions, please feel free to call us at 1-800-486-3996.